How exactly do you explain the concept of a very dark bedroom? Undeniably, the bedroom is one of the most important places in the home where we get to spend quite a considerable amount of time. It has been proven beyond every possible principle, that a lot of persons still prefer to lay down on their beds and watch movies, a responsibility which the sofa is originally designed for. Far from that, sometimes it is okay for a person to want to have their quiet time in the bedroom, or even read a book… but what happens when your bedroom is dark? How do you take off the dull atmosphere that sometimes comes with all things shady? The sad thing about having a dark bedroom is that sometimes, it is very hard to tell… seeing that you live in that apartment, and walk in and out of your bedroom daily, you may not have noticed how dark your quiet space has become. I recently embarked on a trip and decided to chill with my friend at his home… we’ve been buddies for quite long so I didn’t see the need to lodge in a hotel, plus… I had complete access to every part of his home, including his bedroom. Being a professional interior designer, the first thing I noticed when I walked into his bedroom was a dull atmosphere which could be easily traced to the dark shade of the room… for him, it was very hard to tell… for me, it wasn’t! Being someone who never jokes with interior lighting, I decided to get to work… and here are some of the things we did to bring back the brightness in his bedroom. As a carpet gets old, it begins to lose its beauty and give off a dull vibe. But that’s not all, carpets are generally refractive, that is, the help to circulate every light that hits their surface, but when a carpet gets old, it begins to lose it potential to reflect light… instead of that, it absorbs every little light it gets… that’s a definite deal breaker. We launched out on a mission to change the carpets, lucky enough, we found a lightly shaded carpet. If the floors underneath are hardwood, all it would take is some sanding and stain to make them look beautiful. This will brighten up the room a great deal. I wonder why my friend does not like tiles… Well Maybe it’s because it’s a rented apartment, and he can’t really do much… see our tips on how to decorate a rented apartment here. 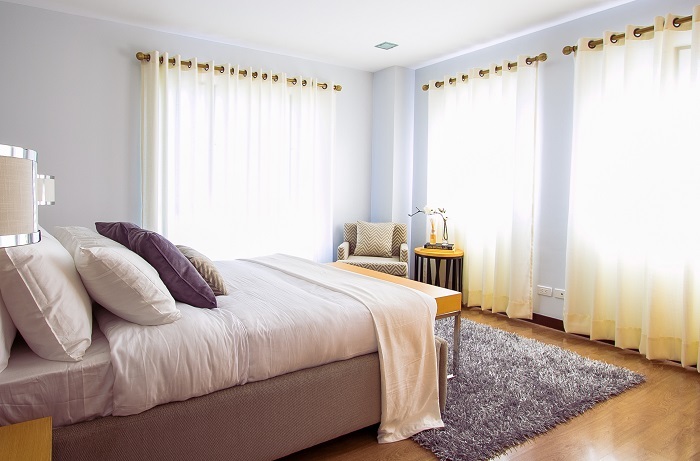 Well, his room passed this test, however I will not fail to sound this out to other blog readers… When it comes to the color of the drapes in your bedroom, you should choose a bright color, allowing the sun to shine through. When it comes to window covers, wooden beautiful shutters are not the best option if you are trying to brighten up your room. Shades will work fine because they can be opened up all the way during the day. If you choose to go with blinds, you should stick with white ones. Colored blinds will only darken the room. I understand that a number of us will always prefer dark-colored beddings, probably because they always look nice, let’s not forget that they will be working against us in our quest to brighten up a bedroom. Now here’s a pro tip:… If you cannot trust yourself to keep a white set clean, try something in light blue, light green, or rose. Just be sure that the set you choose works with the drapes and the color on the wall. If you take out some time to follow these few steps which have been listed in this article, I am convinced beyond every reasonable doubt that your bedroom will be a bright and sunny place to spend your time in. Previous Is Your Kitchen Very Small? Here’s What To Do About It!